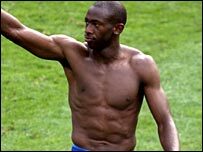 Former Derby and West Ham striker Paulo Wanchope has called time on his 12-year career because of persistent injuries. The Costa Rica striker has played for nine clubs in seven countries, most recently Chicago Fire in US. "I always gave 100%. Sadly, my last performances were far from good enough and I have taken the decision to retire," said Wanchope, 31. "In the last six months I had to make a great effort to recover after games and training with my knee problems." Wanchope, who scored 45 goals in 75 international appearances, began his career in Costa Rica with Herediano in 1994. Three years later signed with Derby before moving on to West Ham and Manchester City. He also had spells with Malaga, Al-Gharrafa, FC Tokyo, Rosario Central and finally moved to Chicago.